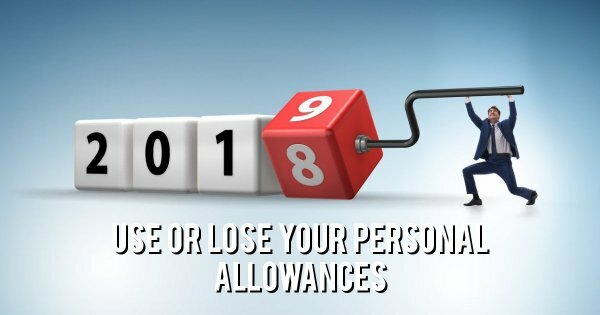 Have you used ALL your allowances for the 2018/19 tax year? How much income will you have in 2018/19? It is really important to know how much income you will have in relation to the tax thresholds. For 2018/19 the tax free personal allowance is £11,850. You are charged 20% on earnings up to £46,350 and a higher rate tax charge of 40% is charged on all income earned over £46,351 up to £150,000. Any income you earn over £150,000 will be charged at 45% tax. What to do it you earn between £100,000 and £123,700 and are subject to an effective 60% tax charge? If you earn under £100,000 per year, you’ll usually benefit from an annual tax-free personal allowance of £11,850. But once your income goes above £100,000, the tax-free personal allowance tapers away at a rate of £1 for every extra £2 you earn. This means your personal allowance is zero if you earn £123,700 or more. For more information read our article: How can you avoid the 60% income tax trap? Basic rate taxpayers are entitled to £1,000 of tax free savings on their savings income and higher rate taxpayers can claim £500, but additional taxpayers do not qualify for this tax relief. If your income goes above these thresholds you could consider making a gift aid donation or make a pension contribution. The dividend nil rate band available for all taxpayers, reduced to £2,000 from 6 April 2018. Thereafter, any dividends falling within the basic rate band are taxed at 7.5% up to £34,500. Dividends that fall within the higher rate band are taxed at 32.5% on earnings up to £150,000, and dividends that fall into the additional rate band are taxed at 38.1% on earnings above £150,000. If you are a UK taxpayer, in the tax year 2018-19 the standard rule is that you'll get tax relief on pension contributions of up to 100% of your earnings or a £40,000 annual allowance, whichever is lower. However, it may be worth contacting a financial adviser to discuss your individual circumstances. You can invest the whole of your individual ISA allowance of £20,000 in a Stocks & Shares ISA before April 6th 2019, or up to £20,000 in a cash ISA, with any balance invested in a Stocks and Shares ISA. A couple can now invest £40,000 in tax efficient investments before April 6th 2019. Remember ISAs are not subject to capital gains tax or income tax.